V For Vendetta.. I have been trying to figure out how, or even whether, to write a review as this movie is unusual. You are either going to be awed by it or dislike it. I doubt there will be many mediocre opinions. I'm definitely on the awed side and most likely will watch it again to catch more of the subtle innuendos and re-listen to the philosophical speeches. In an effort to not ruin the plot for those who might decide to watch this film in the future, here is just a basic overview with some images and quotes. Most people assume Science Fiction means at least aliens or outer space are involved and to be honest, that represents probably 98% of all offerings in this genre now. Many definitions now only offer this viewpoint. Although most does focus on science, aliens and out space, alternate futures have traditionally been included. The Oxford Dictionary offers the following definition, "Fiction based on imagined future scientific or technological advances and major social or environmental changes...." V for Vendetta is an alternate future where England is being run by an oppressive and controlling government. It's a dark, somber movie that in the end gives the power back to the people. While it is loosely based on a graphic novel by Alan Moore and illustrated by David Lloyd - the author has distanced himself from this and all adaptations. Right - Evey being accosted -- Left - the government leader in a Hitler-like public appearance. 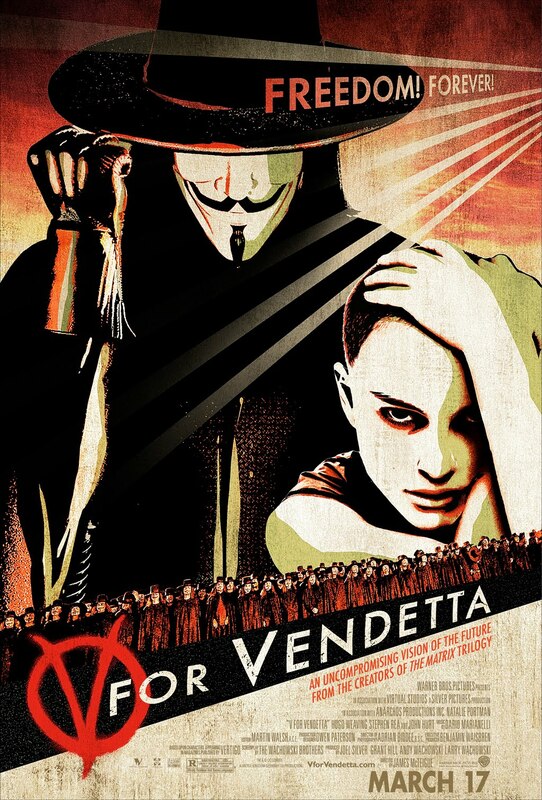 V for Vendetta opens with a nod to Guy Fawkes, a note that continues throughout the movie in the form of the Guy Fawkes mask worn by the main character. Then we are introduced to Evey (played by Natalie Portman) when she is accosted on the streets by 2 government goons as she makes her way home at night - after curfew. V (played by Hugo Weaving) steps into so save her and her world is never the same. should be afraid of their people." Over the course of the movie, the dialogue between V and Evey are the philosophical thread that ties the story together. We alternate between V's attempts to educate Evey and his actions against the government. Woven in are the efforts of the policeman in charge of finding this subversive, his meetings with the government where you hear the lies and corruption behind their actions, a flash back to top secret experiments on human subjects of which V is a survivor, the persecution of those Evey knows as well as a personal journey that is a trial by fire which lets her inner strength out. The casting of Weaving and Portman was crucial. These 2 characters carry the movie in their hands, so had weaker actors been given these roles, it would have failed. Weaving had additional limits as he spent the entire movie with a rigid and strange mask on his face as well as a body swaddled in clothing and cape. It left him only voice and movement as tools to build with. The fact V's strength and power came through is a tribute to Weaving's skill. Portman brought us the human note. She is the real person caught up in the web whose life was changed beyond measure - a new world and one she is ill-prepared to cope with at the start. Her ultimate transformation is startling. All movies come to a climax. This one has it's own unique twist, but you're going to have to sit down one evening and watch it to see where the plot takes you. Dark, subversive, philosophical and thought-provoking all apply here, so if you're just looking for an action film this one isn't for you. There is action, but in between are words to make you think and consider.